With the coming of cool autumn weather, it will soon be prime planting time for tulip bulbs. But many gardeners in the Triangle shy away from hybrid tulips because they are notorious for fading away after their spring flower shows, never to repeat their pretty performances. However, hybrid tulips had their origins as species. And many of them still grow in the wild in temperate regions of southern Europe, Near East and Northern Africa. These species tulips, along with their direct variants, form a group known as botanicals. Botanical tulips aren’t as big, bold and bodacious as their hybrid cousins—most won’t grow over 12 inches high—but some of them have found the southeastern U.S. to their liking and can be reliable performers in the spring garden to the point of even naturalizing in proper settings. The secret to botanical tulips not just surviving but rather thriving—flowering each year and even multiplying—is to mimic their native growing conditions as closely as possible. This means, along with a sunny location, sharp drainage and neutral soil are key to properly growing many species tulips in this area. The drainage requirement can be met in a rock garden setting, raised bed or even containers, while a neutral pH can be maintained with the addition of lime to the soil every year or two. As far as which botanical tulips to try in the Triangle, consider Tulipa bakeri ‘Lilac Wonder’ for starters. With purplish-pink petals surrounding a spot of bright yellow in each flower center, it is a rather pleasant sight in the spring garden. It only grows to about 8 inches tall, but since it needs less chill time in the winter than hybrid tulips to develop blooms, it can be a dependable plant in the South year after year. 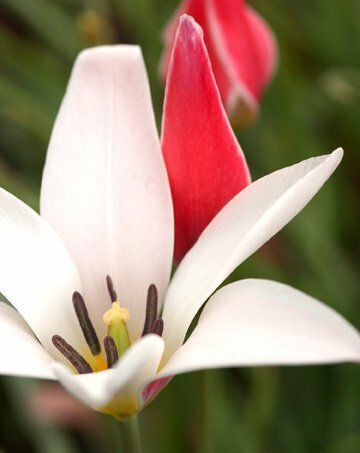 Ditto for many selections from Tulipa clusiana, such as the aptly named red-and-white bi-color ‘Peppermint Stick’ and the similarly shaded ‘Lady Jane’. ‘Tinka’, another T. clusiana bi-color shows off blooms in red and creamy yellow, while ‘Cynthia’ sports a deeper yellow to go along with the red in its petals. 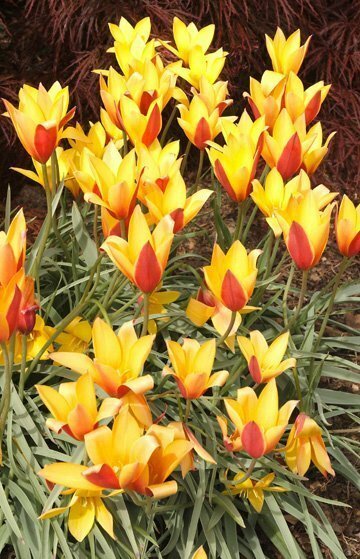 And spring sunshine will get competition from the bright yellow blooms of Tulipa sylvestris, which, although native to Europe, has naturalized in many southern gardens. It seems to be more forgiving of shade than other tulips, making it a good candidate for a woodland garden setting. As a bonus, the flowers are also sweetly scented. These are just a few botanical tulips that can grace Triangle gardens. There are more, some being easier to grow than others. But if you are looking for alternatives to single-season hybrid tulips, and don’t mind trading size for repeat performances spring after spring, explore the beautiful world of botanical tulips. Deer have been known to munch on botanical tulips, but these unwanted grazings can be deflected to a degree by liberally interplanting daffodils, which are deer-resistant. Because of species tulips’ small stature, it is best to go with miniature daffodils such as ‘Tete-A-Tete’, ‘Minnow’ and ‘Little Gem’.